Fireweed (Epilobium Angustifolium) other names: Adelfilla, Blood Vine, Blooming Sally, Bouquet Rouge, Chamaenerion angustifolium, Chamerion angustifolium, Épilobe, Épilobe en Épi, Épilobe à Feuilles Étroites, Epilobio, Epilobium angustifolium, Epilobium spicatum, Flowering Willow, French Willow, Great Willowherb, Herbe de San Antonio, Laurier de San Antonio, Persian Willow, Purple Rocket, Rose Bay Willow, Rosebay Willow, Tame Withy, Wickup, Wicopy, Willow Herb. Fireweed (Epilobium Angustifolium) is a perennially growing herb, which generally grows up to a height of around 28 inches to 5 feet (70 cm to 1.5 meters). This herb produces big flowers of purple hue, while the fruit is like a brown capsule that is open at the two ends and discharges oval shaped seeds. The plants which produce these brilliant magenta hued blossoms are called fireweeds - the common name of the plant has been derived from the fact that they flourish on lands that are either disturbed in some manner or have been burned over. It may be noted that almost immediately after London was ravaged by bombs during the World War II, fireweed plants emerged in the center of the city, where people had not seen this species for several generations. You may find ditches and sites that have been dug up lately to be packed with this herb. Nevertheless, fireweed also grows well in fertile, damp soils and has a preference for highland areas, for instance the Rocky Mountains. Fireweed is indigenous to North America and Europe and has been used for therapeutic purpose in the form of an antispasmodic. The roots as well as the leaves of this herb were used to prepare an infusion, which was given as a remedy to patients suffering from whooping coughs, asthma and even hiccups. The dried up leaves of fireweed were also employed in the form of a demulcent (any medicine that helps to provide comfort to the mucous membranes) and also in the form of an astringent. Although fireweed has been used for therapeutic purposes, the greatest benefit offered by this plant to mankind is in the form of a food. Several Native American tribes consumed the tender shoots of fireweed or cooked the pith of the stem in the form of soups. They also used the leaves of this herb in the form of a potherb (any herb cooked in a pot). French settlers in Canada held fireweed in high esteem and called it ‘asperge' or ‘asparagus'. In addition, the immature flower stalks as well as the leaves of fireweed may be used as ingredients of many salads. As aforementioned, fireweed is native to North America and Europe where the herb is found growing naturally in ditches and newly excavated sites. This plant may also be found growing in damp places, areas that have been burned up recently in damp forests as well as beside river banks. Fireweed can be cultivated without any difficulty and the plant has a preference for a properly drained soil that can retain moisture even in sunlit positions. The plant also flourished in damp soils. Precisely speaking, fireweed has a preference for damp or humid soil, but also has the aptitude to thrive on arid river banks. Fireweed is rather invasive and spreads enthusiastically through its crawling rhizome and usually forms large patches. The herb is suitable for becoming a weed and propagates mainly by its seeds, which are extremely light weight and can travel very far with the help of wind. Generally, fireweed is amongst the first plants to grow as well as form a colony in troubles locations, for instance any place that has been burned up recently. This is an extremely decorative plant and is the floral insignia of Yukon (a territory in north-west Canada). In addition, fireweed also serves as food plant for caterpillars, especially many species of Lepidoptera. Fireweed is also an excellent bee plant. Fireweed is an herb. The parts of the plant that grow above ground are used to make medicine. Fireweed is used for pain and swelling (inflammation), fevers, tumors, wounds, and enlarged prostate (benign prostatic hyperplasia, BPH). Fireweed is also used as an astringent and as a tonic. While fireweed is occasionally considered to be a weed, this herb has been used in the form of a medicinal herb since a long time. 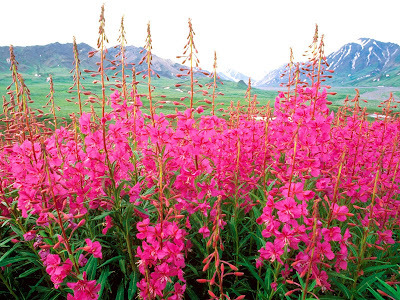 Fireweed is known to possess hypnotic, antispasmodic, tonic and even laxative attributes. In addition, the plant encloses agents that help in the contraction of tissues and also soothe the skin and make it softer when it is applied externally. In the past, the therapeutic uses of fireweed comprised taking the extracts of the plant orally, frequently in the form of a tea or infusion, to treat problems related to the prostate and bladder. It was also taken for treating problems, such as enlarged prostate or benign prostatic hyperplasia as well as a variety of gastrointestinal problems, including diarrhea and dysentery. Since fireweed possesses astringent as well as demulcent properties, fireweed is useful for treating colitis, mucous and also irritable bowel syndrome (IBS). 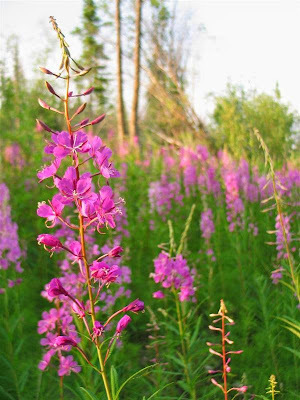 Fireweed has also been employed to prepare an ointment to comfort or ease skin disorders in children. In Germany and Austria, fireweed has been used to cure prostate problems since long. Traditionally this herb is also used for external application in the form of a comforting, cleansing as well as a curative agent to heal trivial burn injuries, ulcers, skin rashes and several other irritations and afflictions of the skin. 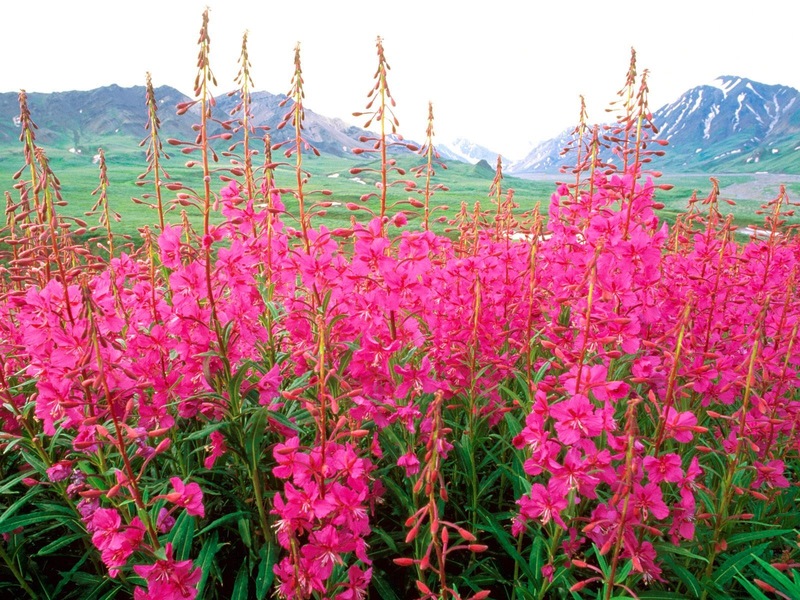 Chemical analysis of fireweed has revealed that the plant encloses profusion of tannins, phenolic compounds, flavonoids - several of which seem to possess biological actions. It may be noted that fireweed is also an medication for the inhabitants of Upper Inlet Denalina, who cure cuts or boils filled with pus by placing a portion of raw stem of the herb on the affected area. It is said that doing this actually pulls out the pus from the boil or cut and also thwarts a cut filled with pus from healing very rapidly. In addition, the Blackfoot Indians also pulverized the internal cortex of the plant into powder and rubbed it on their hands and face with a view to shield them from cold during the winter months. Members of this American tribe also prepared an herbal tea from the root as well as the internal cortex and administered the medication to infants in the form of an enema to treat constipation. The outer stem of the fireweed plant also yields a fiber that may be employed to prepare cordage (fiber ropes). The seed hairs of this plant are like cotton and have been employed in the form of a stuffing material or in the form of tinder (an extremely inflammable substance). Apart from the plant's therapeutic and other uses, fireweed is also used as a food. For instance, the leaves as well as the tender tips of the plant's shoots are edible and can be consumed either raw or after cooking. Some people consider the shoots collected early during the plant's growing season to be a treat. These shoots are generally harvested during the later part of spring or in the beginning of the summer. The shoots as well as the tender stems of fireweed are peeled and often consumed raw or steamed in the form of an alternative for asparagus. Provided the stems and shoots are prepared appropriately immediately after harvesting them, they are an excellent natural resource of pro-vitamin A and vitamin C. It is documented that the Yupik Eskimos conserved the harvested stems in seal oil with a view to consume them throughout the year. 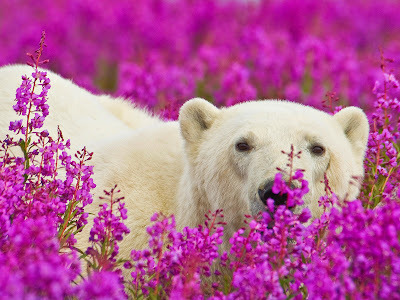 In this context, it may be mentioned that these Eskimos called fireweed as ‘Pahmeyuktuk', which denoted the edibility of the plant. Interestingly enough, even the peelings or flaking of the fireweed stems were not thrown away, but were dried out and used for weaving strong cords for fishing nets. Extremely tender leaves of this plant are also edible and added to salads or soups. Some people also boiled these leaves in water and used the liquid in the form of a tonic tea to treat stomach disorders. Infusions prepared from fireweed leaves are known to result in queasiness or vomiting. On the other hand, mature leaves turn out to be harsh and astringent, but, by this time, the yet to open flower buds are delicious enough for use in salads or in stir-fries. Traditionally, people extracted syrup from the fireweed flowers and stems. This syrup is known to be rich in mucilage content, which made it valuable for the native tribes for preparing berry-cakes which dry up steadily. 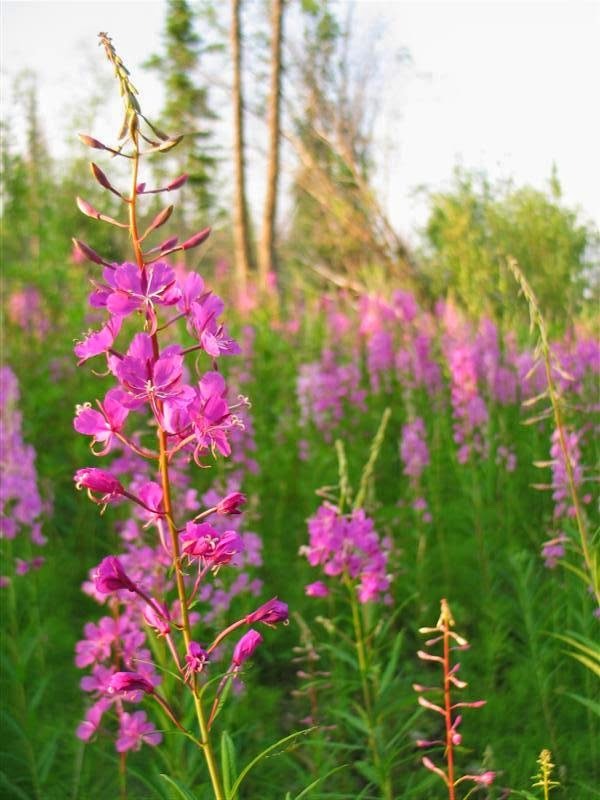 Currently, people harvest the flowers of this plant to prepare fireweed jelly, which may be purchased from small cottage industries engaged in canning. Alaskans pioneered in using the sweet pith of the plant to manufacture vinegars and ales. Even the root of fireweed plant can be consumed in various ways - raw, dried, cooked and grounded into powdered form. The root is generally used during the spring when it possesses a sweet flavour. Fireweed seems to be safe for most adults. Pregnancy and breast-feeding: Not enough is known about the use of fireweed during pregnancy and breast-feeding. Stay on the safe side and avoid use.